This Flexa Loft Slide Bed is a "must-have". 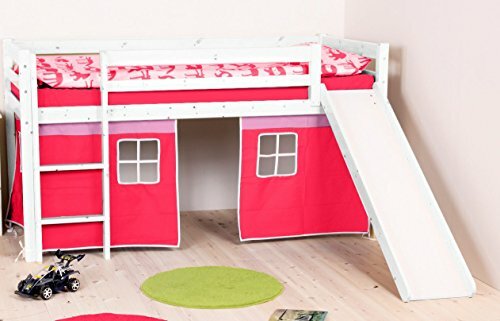 With a fun play space underneath, and a fun way to slide out of bed, this bed is sure to please both parents and kids. Make bed time fun for all. With a capacity to hold 400 pounds, parents can climb into bed for story-time, and not worry about multiple children playing during the day. Flexa has been making the safest loft beds for decades with great attention to detail, safety, and FUN. The bed can be used with or without the slide. The ladder and slide can be interchanged to go on the side that works for you. This loft slide bed takes a standard twin size mattress. The loft system includes a full slat roll, so no boxspring, bunkie board, or extra support is needed. Mattress is not included. Requires assembly - instructions included. White Washed Lacquered Pine Size: 82" Length x 86" Width (w/ slide) x 45" Height Width Without Slide: 41" Underbed height is 30"
If you have any questions about this product by Flexa for Kids, contact us by completing and submitting the form below. If you are looking for a specif part number, please include it with your message.